A few weeks ago, I posted on my Facebook page a picture of the embassy of the Republic of China to the Vatican (Holy See), which got more likes and viewers than I'd expected. 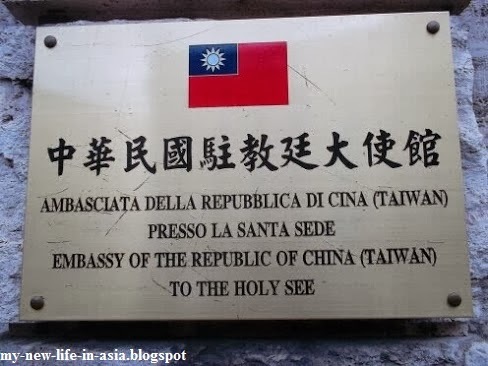 So I decided to write a short blog post about this, in which I will show you the location of the embassy and briefly talk about the history of the relations between the Vatican and the Republic of China. The Vatican is the only state in Europe that still recognises the Republic of China and not the People's Republic of China. 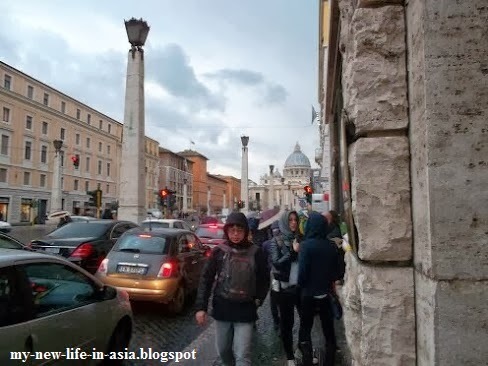 As a consequence, Rome is the only city in the world where you can walk from the embassy of the People's Republic of China (PRC) to the embassy of the Republic of China (ROC). The first is in Italian territory (Italy recognises the PRC but not the ROC), while the latter is in Vatican territory (the Vatican recognises the ROC, but not the PRC). Rome is the only place on earth where the ambassador of the ROC and the ambassador of the PRC could bump into each other on the street, dine in the same restaurant, or have a drink in the same club or cafe'. I was thinking that perhaps they might even make friends with each other without knowing who they really are; but given the East Asian habit of showing each other visit cards, I doubt whether this would ever happen. The Vatican is a unique case among the world's states. It is an enclave within Rome, with no borders and no own currency (the Vatican uses the Euro). Therefore, despite having its own administration, passports, and police force, the Vatican is in all respects a piece of Rome. Since I am in Rome now, I decided to go and take a look at the embassy of the ROC. Before going to Taiwan, I had never paid attention to it. 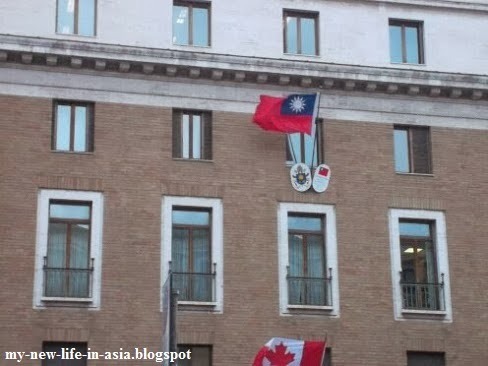 But after living in Taiwan for a while, I was glad to see the flag of the ROC publicly displayed in my own country and in Europe. In most other cities, using the ROC flag would undoubtedly trigger official protests from Beijing. Rome is also the only place in Europe where the President of the ROC enjoys the status of a world leader. For instance, on March 20, 2013, ROC President Ma Yingjiu (馬英九) and his wife Zhou Meiqing (周美青) attended the inauguration ceremony of Pope Francis (note). Judging by his smiles, Ma must have found pleasure in such a rare occasion, when he could be a statesman among equals and sit next to Angela Merkel or Joe Biden. Since I have got used to seeing the ROC belittled and neglected, I thought that the ROC embassy would be in some small alley, hidden from the sight of passers-by. But in fact, it is located in the very heart of Rome, in Via della Conciliazione. This monumental boulevard, built between the end of the 1930s and the beginning of the 1950s, is a prestigious thoroughfare that leads from the Tiber river directly to St. Peter's Square. If you want to see more pictures of the embassy and the surrounding area, check my Facebook page. During the Qing Dynasty, the Chinese government first tried to establish diplomatic relations with the Vatican. The reason behind this attempt was of political nature: at that time, France had a protectorate over the Chinese Catholic church. China wanted to reduce French power in her own territory by taking Sino-Vatican relations into her own hands. Prime Minister Li Hongzhang and the British ambassador conveyed the message to the Vatican, which was also interested in starting relations with the Middle Kingdom. However, France protested and threatened to break off diplomatic relations with the Vatican and take measures against the French Catholic Church. The Vatican was thus forced to abandon the plan (see Leung 1992, pp. 42-43). The same thing happened again in 1918, six years after the Qing Empire had been overthrown and the Republic of China had been founded. In 1919, Pope Benedict XV sent Archbishop Celeso Constantini as an Apostolic Delegate to China, but without diplomatic status (ibid., p. 44). During the Republican era, relations between China and the Vatican were overall good. The two most important men in the Republic, Sun Yat-sen and Chiang Kai-shek, were both Christians. Two other major families of the Chinese establishment of the Republican era, the Song and the Kong, were Christians, too (Nicolas Standaert / R.G. Tiedemann: Handbook of Christianity in China. 2009, p. 710). In 1928, Pope Pius XI even issued a declaration in which he gave his support to Chiang Kai-shek's unification of China. However, there were also occasional tensions between the Vatican and the Guomindang regime. For example, in 1934 the Vatican recognised Manchukuo, the puppet state established by the Japanese, arousing Chiang's anger (Seib 2013, p. 81). In 1942, the Guomindang government appointed Xie Xiukang as the first Chinese ambassador to the Vatican, although the Vatican did not have any ambassador in China at that time. It was only after the war, in 1946, that official diplomatic ties between the Republic of China and the Vatican were established. Pope Pius XII sent Archibishop Antonio Riberi (known in Chinese as 黎培理, pinyin: Lí Péilǐ) as the first Vatican ambassador to Nanjing, which was the Chinese capital under the Guomindang regime (Leung 1992, p. 44). According to Edward Idris Cassidy, ambassador to the Republic of China in 1970-71, after the Communists won the Civil War and Chiang Kai-shek retreated to Taiwan in 1949, Riberi was arrested and expelled to Hong Kong. Afterwards, the Vatican officially moved its embassy from Nanjing to Taipei (see Cassidy 2009, pp. 48-49). im not interested in history at all, but i went through this post to the end. very interesting . glad to know that the vatican dont reconize prc…haha. thanks for the imformation! Thanks a lot : ) I'm glad you enjoyed this post even though you don't like history. I've been there,too. As the Vatican claims it is the embassy of "China" and that is the dilemma. The Republic of China is not Taiwan. It is still until today the Chinese nationalist government founded in 1911, with Nanjing as its capitol. Then you walked inside the embassy you will find maps showing a China map, there clearly stands in Italian "Taiwan, Province of China". So the conclusion there are two Chinese governments claiming Taiwan as their province, but in fact nobody including the ROC regards Taiwan as a country.